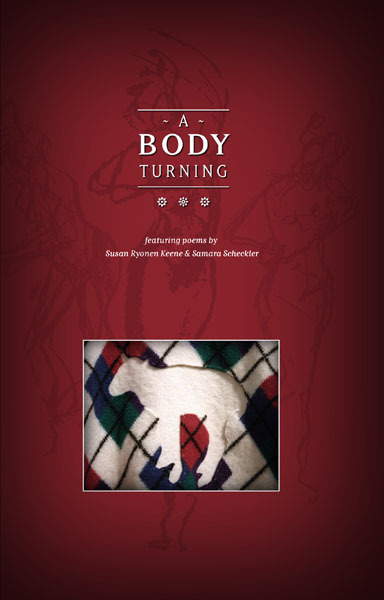 A Body Turning was published as the culmination of a creative writing workshop I directed more than a year ago. Poems by Samara Scheckler and Susan Ryonen Keene are featured in this book as well as an introductory essay written by myself. When I studied art at the university the goal of each student was the senior art exhibit. From a student’s body of work the best art objects were selected for the show. That’s how the poetry writing workshops I direct are planned. Students work on poems for several weeks and then we select, edit and publish their best work in a collection of poems. If you’re interested in an upcoming poetry writing workshop, please leave a comment or email me at coffeehousejunkie [at] gmail [dot] com. Order A Body Turning (paperback, 48 pgs, 8.5″x5.5″ $10 + s/h) today!